← ModCloth 25% off sale on select gift and stocking stuffers and more! We have been in kind of a food slump lately; nothing seems to sound very good and we needed a bit more variety. I needed to eat something new and different! I also didn’t want to be prepping and cooking food all evening when I want and need to spend more time with my baby and husband. I looked around on Pinterest (which makes me mostly just want to bake) and was inspired by a photo on The Big Oven. I wasn’t a fan of all the ingredients so I came up with my own version and used tomatoes instead of pimentos and left out a few ingredients. The result? DELICIOUSNESS. I’m making this chicken again, soon! 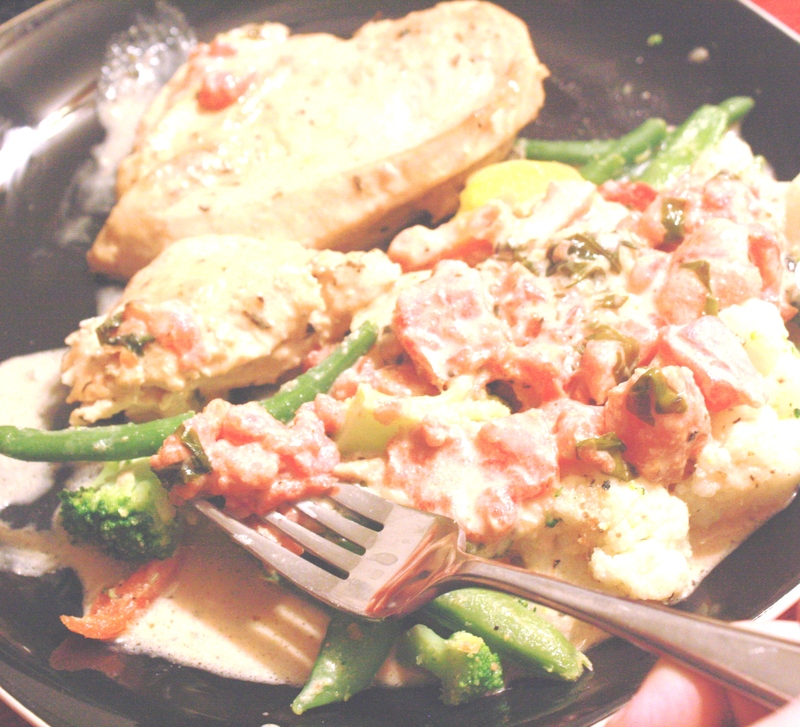 Not a very good picture, but we poured the chicken and the sauce over mixed veggies. I made this for dinner tonight and it was really good! I served it over angel hair pasta and steamed broccoli – SO yummy. Thanks for the awesome recipe! I’m so glad it turned out and you enjoyed it! That’s a *lot* of heavy cream. Sure, but you can always sub part of it with milk. 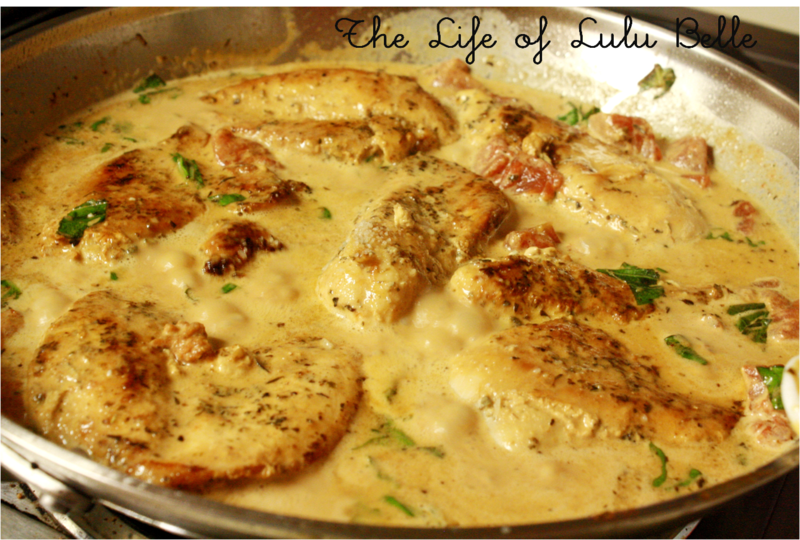 This looks so yummy and a perfect Trim Healthy Mama “S” for satisfying dish. Add a side of steamed broccoli or cauliflower and a nice salad to make perfect “S” dinner. Awesome! I’m looking forward to enjoying dairy again so I can eat this! This was AMAZING! Thank you so much for sharing. It is definitely going into my regular rotation. I made this last night. It was awesome and will be making it again. My 18 year old daughter made this all by herself, her first time in charge of a whole dinner and it came out amazing. She was very motivated from the family reviews and is excited to keep cooking for us!! Thank you. I can see how we can modify to make it a little different with pasta, or veggies, or even white rice or mashed potatoes. it all sounds goods..